The top engine builders in the racing world rely on Borla exhaust for maximum performance. Pit Stop USA has all of your Street Performance needs including Pontiac Firebird (4th Gen) Exhaust. Pit Stop USA is The Online Motorsports Superstore! Borla Performance Industries is the leader in the design and manufacture of stainless steel performance exhaust. Borla is committed to providing world class exhaust products. The top engine builders in the racing world rely on Borla exhaust for maximum performance. Borla is at the forefront of the movement toward responsible racing with their full line of patented, award and race-winning racing mufflers that not only maintain a race engineas power, but in some instances actually add power. Borla XR-1A Raceline products are the choice of todayas hottest drag and oval track racers. Featuring a patented uninterrupted-flow design and multi-core technology, Borla XR-1A mufflers actually outflow a straight piece of pipe in repeated testing. Borla XR-1A race products are made in the USA and constructed of aircraft-quality T-304 stainless steel for track tough durability. 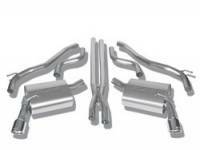 They meet the strictest noise requirements and use sound-absorbing stainless steel packing to protect against burnout. Hands down, Borla XR-1A Raceline offers the best balance of sound and power. Borla XR-1A Sportsman Racing Mufflers are made from T-304 stainless steel. Patented, race-winning XR-1A Raceline technology. Borlaas #1 selling racing muffler. Satisfies the needs of most racing applications because it is the lightest, most compact, and highest flowing racing muffler in its class and at a competitive price. Borla XR-1A Hooter's Series Slim Line Muffler is made from aircraft-quality T-304 stainless steel and Borla XR-1A Raceline Exhaust Technology. This unique, durable race muffler uses oval tubing and incorporates a slim profile for maximum ground clearance while maintaining significant sound attenuation. The choice of champions of the Hooter's ProCup Stock Car Series. Borla-powered cars have dominated this series since being allowed in. 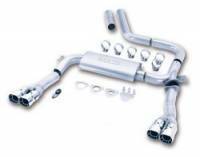 We feature Borla Exhaust products at low everyday prices!